Based on either Ukraine Intrnational Airlines or top ranked Qatar Airways promotion you can book discounted return flights from London to New Delhi already for £281 roundtrip! Fares are including all taxes and fees, meals and checked luggage. Flights have usually one short layover in Kiev or Doha. The cheapest solution is ased on UIA and if you would like to experience service of 5* carreir you can book discounted flights with Qatar Airways from £314. Both deals offer discounted flights from end of February to end of May except blackout period around Easter Holidays or 25th of August to 30th of November 2019. Based on latest date of your outbound flight from the United Kingdom to India. UIA sale is running till 10th of February and max stay in India is 12 months. Qatar Airways promotion available till 28th of February and max stay is one month. Travel samles. You can compare all the cheapest flights at Qatar Airways or UIA website. Need your hotel room in New Delhi, India in advance you can use Hotels.com or Booking.com. 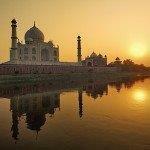 Booking sample of cheap return flights from London to New Delhi from £281! As per above deal you would depart from the UK to New Delhi on 2nd of March. Inbound from New Delhi back to London Gatwick on 16th of March 2019.